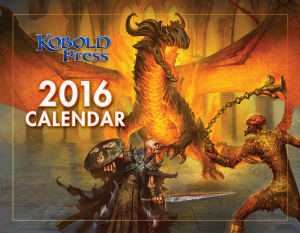 Enjoy 13 Months of Wondrous Adventure in the 2016 Kobold Press Calendar! Wondering what the new year will bring? Wonder no longer! 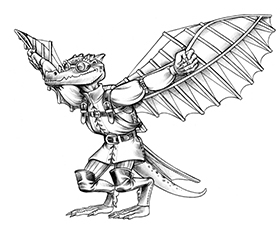 With the 2016 Kobold Press Calendar on your wall, each month takes you from the fey court of the River King, to the citadel of a powerful void dragon, and beyond! These scenes are brought to life by talented artists including Marcel Marcado, Cory Trego-Erdner, Aaron Miller, Guido Kuip, Bryan Syme, and Fred Fields. The 2016 Kobold Press Calendar makes a perfect gift for the fantasy, SF, or gaming fan in your life—or the perfect addition to your own gaming den! AND you can find it in our Kobold Press store right now! Fantastic! Just ordered mine. 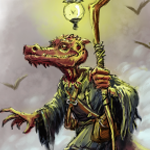 I had the 2014 Kobold Press calendar, and really missed having one in 2015. I’m excited to be getting one for the coming year. Awesome! You will not be disappointed! The art is fantastic (and there’s more of it this year) AND there are tons more cool ‘dates of geek interest’ this year.